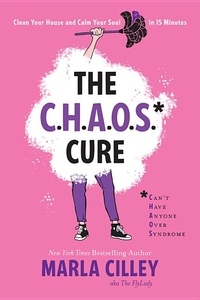 Are you suffering from CHAOS, otherwise known as Can't Have Anyone Over Syndrome? If your house is a jumble of dirty dishes, piles of paper, and never-ending laundry, you are probably afflicted. But don't give up hope, because now there's an antidote: The CHAOS Cure. In her eagerly anticipated new book, Marla Cilley--aka "The FlyLady" to the hundreds of thousands who visit her website for daily domestic inspiration--reaches into our homes to help make housecleaning more meaningful and life less messy. With a little bit of armchair therapy and plenty of practical, tactical tips--such as "On the Fly!" quick fixes and genius uses for sticky notes--she'll help us get our houses in shipshape order before we can break a sweat. Along the way, the FlyLady teaches us to embrace household maintenance as an act of self-care, and to enjoy the soothing satisfaction of an orderly habitat. Before you know it, you'll be on the fast-track to living CHAOS-free, surrounded by sparkling serenity.